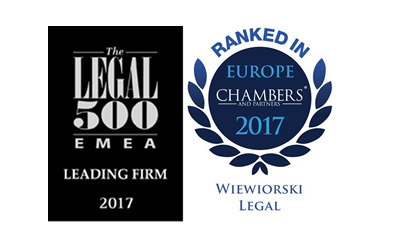 The content and layout of the website of Wiewiorski Legal are copyright protected. Any use of the website content (in its entirety or in part), its copying or processing without the prior consent of Wiewiorski Legal is prohibited. In particular information materials designed to be downloaded by website users may only be used, for his/her own purposes, by a person who has downloaded them from the website of Wiewiorski Legal, to obtain general information about matters to which such materials refer. Such materials must not be in any way processed, copied or included in any other publications. No information contained on the website of Wiewiorski Legal, including information materials intended to be downloaded by website users, constitutes legal advice. Prior to taking any decision or action to which the content of the website refers, or abstaining from such a decision or action, a website user should seek legal advice. Terms “Wiewiorski Legal” and “Kancelaria Prawna Wiewiórski” refer to „Kancelaria Radcy Prawnego Marek Maciej Wiewiórski” – a law firm within the meaning of the Polish Legal Advisors Act. Marek Maciej Wiewiórski, attorney at law (radca prawny), providing legal services in the form of „Kancelaria Radcy Prawnego Marek Maciej Wiewiórski” is entered into the register maintained by the Council of the District Chamber of legal Advisors in Wroclaw under entry number 1301.